A very effective learning tool! Having briefly learnt German during school, I found this as a great refresher to get me back into the mind set of learning a language. 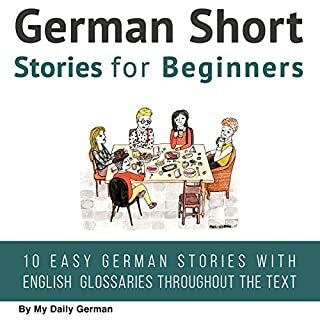 The stories were fun to listen to and the glossaries at the end of each chapter were especially useful when it comes to learning new words as well as improving my pronunciation. It was surprising how quickly things came back to me! I also found the supplementary PDF useful because, as a visual learner, I do like to have something to look at and this PDF provided the perfect aid for the learning experience.